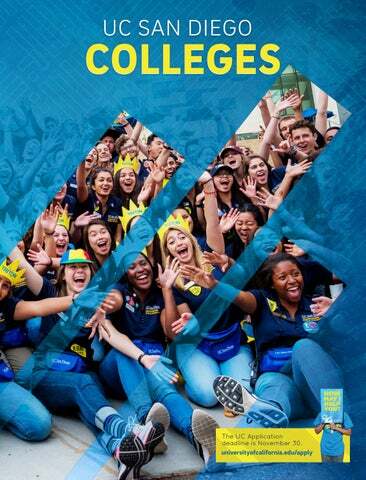 The UC Application deadline is November 30. 2 Warren College Writing Program Includes 2 quarters of intensive instruction in university-level argumentative writing. Making of the Modern World 5-course sequence includes 2 quarters of intensive instruction in universitylevel writing. 2 Formal Skills Calculus, Symbolic Logic, Computer Programming and/or Statistics. Quantitative and Formal Skills Choices available for science majors and non-science majors. 12 Programs of Concentration (PofCs) for B.A./B.S. degrees (except engineering) 2 PofCs, not related to each other and outside the major discipline. Each PofC contains 6 courses. OR 6 Area Studies for B.S. degrees in engineering 2 Area Studies, 1 in the Humanities/Fine Arts and 1 in the Social Sciences. Each containing 3 courses. Natural Sciences Choices available for science majors and non-science majors. Regional Specialization At least 2 upper-division courses from one geographic area. 2 Muir College Writing Program A 2-course sequence, MCWP 40 & 50. 3 Social Sciences GE A 3-course sequence. 3 Mathematics or Natural Sciences GE A 3-course sequence. Options are available for nonscience majors. 6 Fine Arts, Foreign Language or Humanities GE Two 3-course sequences from two of these areas. "Sequences" must come from a defined set of courses, typically in one department or area of study. – Optional, a minor may be used in lieu of a PofC or Area Study if outside the major discipline and unrelated to the discipline of the other PofC or Area Study. IGETC certified •	IGETC clears all lower division GE sequences if certified by your community college before transfer. •	Students with IGETC must complete ONE of the following Writing courses at UC San Diego: MCWP 50 or 125. Transfer Students from other UC Campuses •	A letter of reciprocity from your original campus stating that you completed your GE requirements prior to transferring to UC San Diego, will waive the lower division GE sequences. •	Students with UC Reciprocity must complete MCWP 40 and 50. Writing courses from your original UC campus may be petitioned toward the writing requirement. All other transfer students •	After Transfer to UC San Diego, Muir College will determine which of your transferable courses satisfy the Freshmen GE sequences listed above. •	Transfer students must complete MCWP 40 and 50. Quarter courses 5 Humanities 5-course sequence includes intensive university-level writing. Quarter courses 3 Culture, Art and Technology Includes 1 quarter of critical reading and 2 quarters of intensive instruction in university-level writing and digital literacy. Quarter courses 3 Dimensions of Culture Diversity, Justice, and Imagination courses, also includes intensive university-level writing. Mathematics 3 courses in mathematics to include two courses n Calculus and one course chosen from an approved list. Natural Science 5 courses in Natural Sciences to include courses from Biology, Chemistry, Physics and Environmental Sciences. Separate sequences available for Science majors and for Arts, Humanities and Social Science majors. Fine Arts From Music, Theatre & Dance or Visual Arts. 0-4 Language other than English Can be met by proficiency or coursework. 3 Natural Sciences 1 course each in Biology, Chemistry and Physics; choices available for nonscience majors. 2 Mathematics, Statistics or Logic Choices available for non-science majors. 2 Humanities/Culture 2 courses in specified domestic and selective global cultures. 1 Fine Arts 1 appreciation-based course in Music, Theatre & Dance or Visual Arts. 4 Disciplinary Breadth 4 courses outside of your major; 2 must be upper-division; 1 must be writing intensive. Public Service option may fulfill one course. IGETC certified •• IGETC does not clear all lower-division GE requirements. 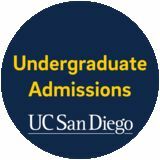 •• Students with IGETC must complete these requirements before transfer or while enrolled at UC San Diego: •	3 courses in Mathematics to include two courses in Calculus and one course chosen from an approved list •	5 courses in Natural Science to include courses from Biology, Chemistry, Physics and Environmental Sciences. Separate sequences available for Science majors and for Arts, Humanities and Social Science majors. All other transfer students •• After Transfer to UC San Diego, Revelle College will determine which of your transferable courses satisfy the Freshman GE requirements listed above. ARI "The coolest thing about going to UC San Diego is definitely the six college system. It doesn't matter what major you are or what you are studying. You still get that diversity of being with everybody, but you’re in these smaller groups, which means I'm on a first name basis with my Deans, my Academic Advisors and my Counselors, and that's something that is really unique to us."